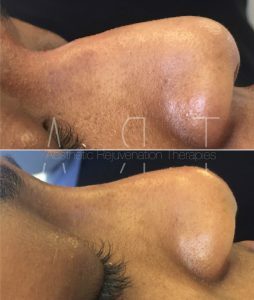 Non-surgical Rhinoplasty is ideal for those who would like improvement in the shape and appearance of the nose, without having surgery and huge expense. Downtime You can go back to your daily activities almost immediately. Some slight swelling or bruising is expected. This will usually fade within 5-7 days. The procedure is performed using topical numbing cream and there is virtually little or no pain, bruising or swelling. There is no down time and results are immediate. Controlled and precise injections are used to correct a low or wide nasal bridge, hide a nasal hump, raise or add to the nasal tip, correct dents, irregularities and asymmetry to restore a more balanced and attractive nose. Our Non-Surgical Rhinoplasty treatment will last from 6 to 12 months. At A.R.T Aesthetics, we offer an initial consultation at £25, deductible on treatments. The consultation usually lasts 30mins. You will meet one of our highly qualified aesthetician who will guide you through the process and answer any questions you may have. To book your Consultation, please call us on 01277 633907. Take action to address your aesthetic skin or body concerns.